The group of ArcTrain PhDs, PIs and seminar lecturers. Only two weeks after the successful Kick-off Meeting, we found ourselves on the way to the beautiful Harz Mountains for our first retreat. “We”, that is the 12 new ArcTrain PhD students, four ArcTrain associated PhD students and two Canadian ArcTrain PhD students. In the following three years there will be at least three of those events and to start with an Arctic-themed seminar for Arctic-themed PhD students sounded quite obvious. Indeed, after passing the 500 m a.s.l. mark the world was suddenly covered in snow; snow that had already lasted some time, making it appear more like ice than snow, which really favoured the feeling of a real Arctic retreat. After we arrived, lunch was served and we directly started into our first seminar day. As an opening we got a general introduction about ArcTrain and what will happen within the next three years. Following, we had the first of our interesting seminars: Good Scientific Practice. Here we learned about scientific misconduct, as well as “do’s” and “don’t’ s” in sciences. This lecture was followed by a discussion about Becoming a Scientist and the differences between being a good, a successful and a great scientist. In the evening there were no further seminars, but an ice-breaking event: We played a game of “Werewolves” with our supervisors, a really nice and fun way of getting to know each other better and becoming a group. After having survived the night with terrible creatures (the werewolves), we started freshly into a day of Time and Project Management, one of the essentials for every project. Besides learning a variety of basic and really useful knowledge on the topic, we had the chance to work on our individual project plans to retrace the recently learnt theories. In the evening, there was time for some general organization topics, like electing our PhD representatives, and for a movie. It was, of course, a climate change-related documentary (Before the Flood) with high potential of subsequent discussion. 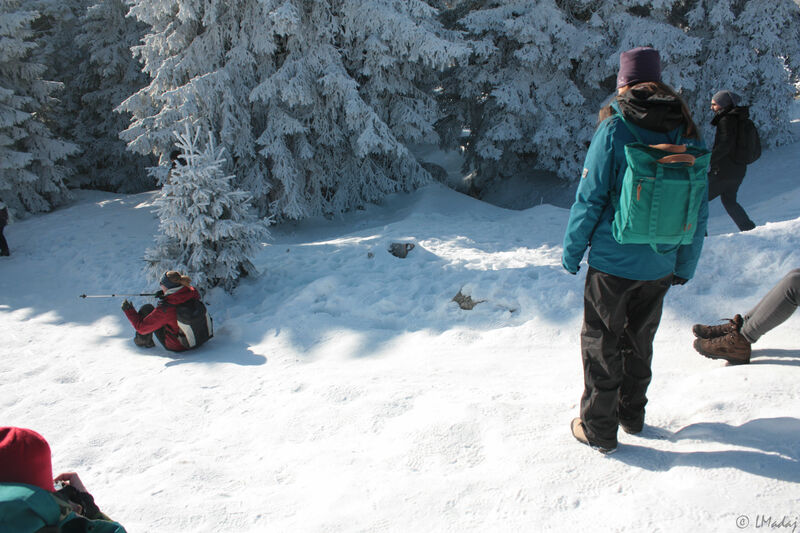 Our way through the magical winter forest to the summit of the Brocken. 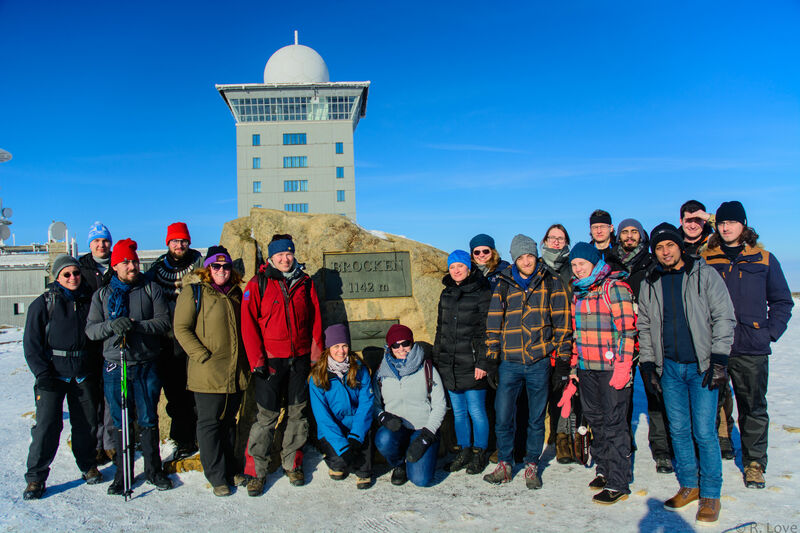 Happily we arrived at the top of the Brocken enjoying the beautiful sunny view. The third day of our retreat was meant to be for team building activities. Since we were in the Harz Mountains what other option was there than hiking up the Brocken, the highest mountain of the area (1141 m a.s.l.)? This is exactly what we did. Dressed for nearly arctic conditions and equipped with a map, GPS and first aid kit we started our way through the woods. We only met a few people on our way along the snow-covered steep hiking trails. Apart from our own chatting, we could only hear the noises of the woods. A few times we were able to also hear the historic Brocken Train. Once, when it sounded really close, we actually stood still and waited for it to pass – somehow surreal. The echo of the train sounded so powerful but the train turned out to be smaller and slower than expected, which still didn’t take anything away of its nearly magical appearance. With every meter closer to the top, the sky became bluer. For the last section of the way the sun was out, which motivated us even more to reach the summit. Sliding is sometimes the most convenient way down a mountain. After about 2.5 hours we made it the top of the Brocken and were rewarded with a beautiful sunny view. A hot chocolate and some lunch encouraged us for the then following way down. Since the snow was already partly frozen the way down felt much quicker than the way up. Some of us spontaneously decided against hiking but sliding down on their butts for some parts of the way. It must have been a funny picture but this way noone of us got hurt by slipping on the ice. After around six hours outside hiking, we safely arrived at the parking lot, where we started our journey in the morning and began our drive back to Bremen/Bremerhaven. All in all, those past three days doubtlessly set a solid base for the next three years that we will spend together. We developed a great group dynamic and bonding after this first adventure together. Also we learned how to structure and plan our projects and what to respect to become good, successful, and great scientists at the end of our PhD studies.